“Dovetail” refers to the shape of the projections of one member, when looked at broadside. These projections are called dovetails, or merely tails. The projections on the other member are called tenons or pins, and the spaces between both tails and tenons are called mortises or sockets. No. 47. 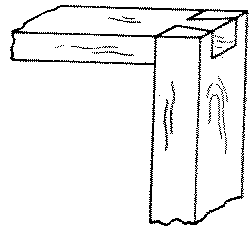 A thru single dovetail is similar to a slip-joint except that instead of a tenon there is a dovetail. It is used in window-sashes. No. 48. 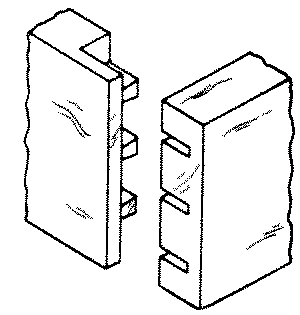 A thru-multiple dovetail consists of a series of alternate tails and tenons which fit one another closely. It is used in tool-chests and in other strong as well as fine boxes. To make a thru multiple dovetail joint, first square lines with a sharp pencil around the ends of both members to locate the inner ends of the dovetails and the pins, d e on X, Fig. 250, and l m on Y. The distance of this line from the ends of each member may, if desired, be slightly (1⁄32“) greater than the thickness of the other member. Divide this line, d e, on the member to be dovetailed, X, into as many equal spaces as there are to be tails (dovetails). From the division points of these spaces, a b c, to the right and left lay off one-half of the greatest width of the mortises to be cut out, and also the same distance from d and from e, as at f f f f and g g g g.
Fig. 250. Laying Out a Dovetail Joint. 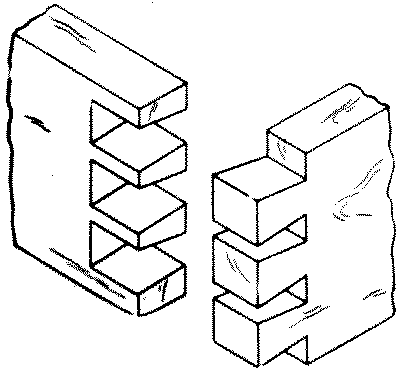 The strongest arrangement of dovetails is to make them equal in width to the spaces between them, as in No. 48. For the sake of appearance they may be as much as four times as wide as the spaces, but ordinarily should not be wider than 1¾”. Set the bevel-square so that it will fit the angle A B C, Fig. 250, in a right angle triangle, the long side of which is 3″ and the short side ⅝”. This is approximately an angle of 80° or a little more than one to five. From the points f f f f and g g g g lay off this angle to the end of the piece. Carry these lines across the end at right angles to the surface, h i, Fig. 250, and repeat the dovetail angles on the other surface. Mark plainly the parts to be cut out (the mortises), as on X in Fig. 250. Score with a knife point the inner ends of the mortises, d to f, g to f, etc., and across the edge at d and at e. With a dovetail-saw, Fig. 93, cut on the mortise side of each line down to the cross line, d-e, and also along the cross line from d to f and e to g. Chisel out the mortises taking care to keep the line d-e straight and square. The ends (not the sides) of the mortises may be slightly undercut to insure a tight fit. Fasten the other member, Y, upright in the vise so that the end to be tenoned will be flush with the top of the bench, and with the working face toward the bench. 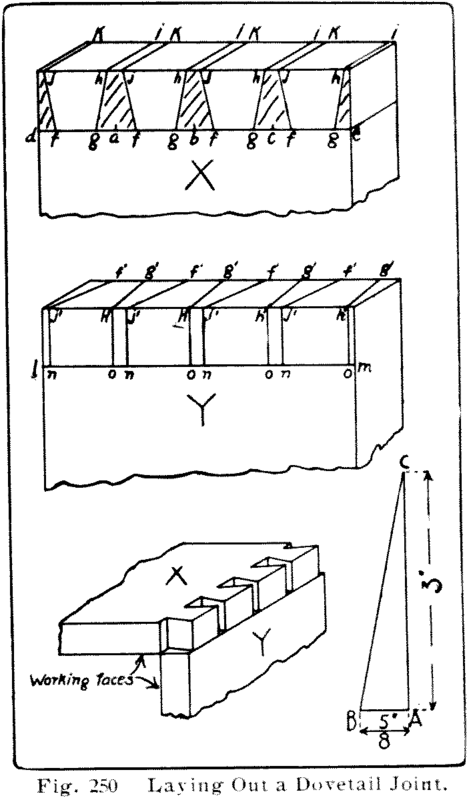 Place on it the working face of X, (the member already dovetailed,) taking care that the inner ends of the mortises are in line with the working face of Y, and that the edges of the two members are in the same plane, as X on Y in Fig. 250. Scribe with a knife point along the sides of the tails on the end of Y (f’-j’ and g’-h’). Remove Y from the vise and square down these lines to the cross line l-m (j’-n and h’-o). 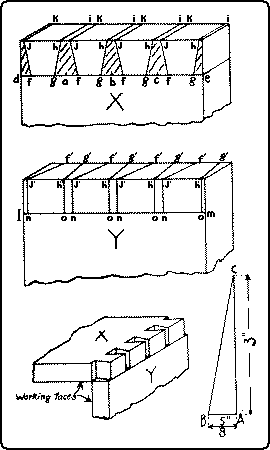 Score with the knife point the inner ends of the mortises of Y (n-o). Saw with a dovetail-saw on the mortise sides of these lines, chisel out the mortises and fit the parts together. When glued together, the joints should be dressed off. Where there are several parts to be made alike, it is necessary to lay out the dovetails on only one X member. This may be used as a templet for laying out the others and they can then be sawn separately. Or all the X members may be clamped carefully together, with one X already laid out, rights and lefts in pairs, and edges and ends flush, the depth mark gaged all around, and then all sawn at once. The dovetail joint is also made by first laying out and cutting the members having the pins, and then superposing this on the piece to be dovetailed, and scribing around the pins. No. 49. 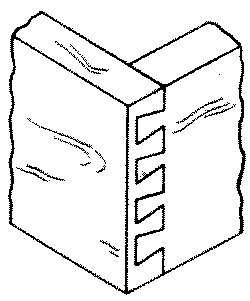 A lap or half blind dovetail is a dovetail joint in which the tails on one member do not extend entirely thru the thickness of the other member. It is used in joining the sides to the fronts of drawers and other fittings where only one side is seen. If the joint is to be used for a drawer front, the groove for the drawer bottom should be cut or at least laid out before laying out the joint. See also drawers, and Fig. 287, On the end of the drawer front, gage the depth of the joint. Gage the same distance on both broad surfaces of the drawer sides, marking from the front ends. Lay out and cut the dovetails as in a thru dovetail joint, taking especial care to have the groove for the bottom completely within the lower tail. Take care also to make the sides, one right and one left, not both alike, so that the groove will come inside. Lay out the drawer front by superposing the dovetailed side, X, on the end of the front, Y, as in a thru dovetail. Saw and chisel out the mortises and fit together. No. 50. A stopped lap dovetail is one in which neither the tails nor the pins extend thru the other members. Hence the joint is concealed. The lap may be rounded. It is used in fine boxes, trays, etc. No. 51. 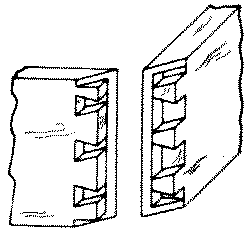 The blind miter or secret dovetail is a joint in which only part, say one-half, of both boards is dovetailed, the outer portion being mitered. The edges of the boards are also mitered right thru for a short distance so that when finished the dovetails are invisible. It is used in highly finished boxes.